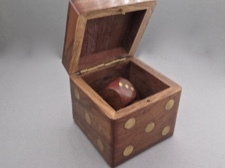 What a clever idea - a dice box full of dice! 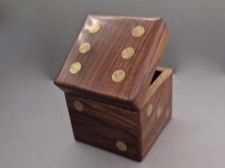 Made from Indian Rosewood and inlaid with brass. 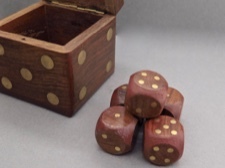 Box contains 5 large smooth dice, cube sides are 3/4 inch. The box measures 2.5 inches on all sides. 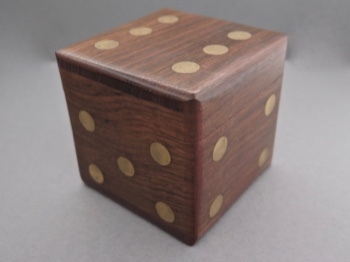 This box is created with hand tools skillfully carving blocks of sustainably harvested wood. This means the wood used comes from managed forests, that people consciously protect the ecosystems, wildlife and the trees in these wood sources to enable long term usage. This is an important effort in keeping our planet safe.